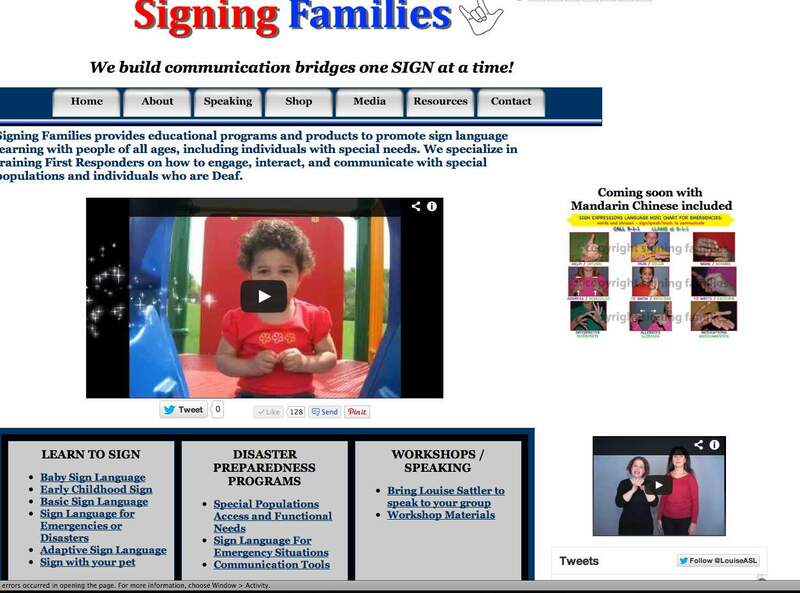 SIGNING FAMILIES has a NEW look! WHY? Over the years my focus has expanded. I use to be one of the many “baby sign language’ companies out there, although I took a more developmental psychology approach with our DVD and courses aimed at teaching language models. Of course, we also offered programs and products for people who wanted to learn the basics of sign language. However, it became more and more important to me to provide quality information, workshops and affordable products to not only parents, but to many other groups, too! First Responders, Community Responders (CERT), Law Enforcement and EMS (including Fire Departments). I totally admire the work of our emergency and disaster response providers and it is a privilege each and every time I speak to these brave and dedicated organizations. Thank you all. Educators. I recognize that educators work in a variety of milieus- including as home educators / homeschool teachers. I appreciate that teachers are in need of affordable and accessible materials as they often need to shoulder the responsibility of purchasing classroom materials themselves. Therefore, I try to offer many items, such as YouTube videos, FREE and communication charts, inexpensively. Community Organizations From hospitality management to those who are in the entertainment industry, it has been my pleasure to consult and provide resources. I especially have enjoyed educating people in our communities about how special populations often use sign language, as well. Many are surprised to find out that the Autism and Down Syndrome communities use sign language, too. Sign is not only for the Deaf! KIDS! I have worked with thousands of children over the years. There is nothing like the joy and enthusiasm of a young child learning to sign for the first time! What is NEW about SigningFamilies.com?! To start, we have made it (we hope) easier to find content and specific information about workshops and products. We also added new features such as information about Deaf Dogs and Deaf Dog Adoptions. Our video and photo gallery sections will be enhanced in weeks and months to come – so check back frequently to take advantage of learning ASL with our short videos. Soon we will have regular features from USTREAM on our website. To keep the sign language learning flowing! Want Sign Language Tutoring? Check out our SKYPE tutoring option! And.. we added a CONTACT FORM so you can let us know what you wish to see on SigningFamilies.com. None of this would have been possible without the help of my hubby and webmaster, Marc and our friends at Weiss Business Solutions. THANK YOU SO MUCH! Let us know if there is content you wish to have us add.